Not a game that will live any length of time in the memories of those there, but Harrow notched their way to what ought to the safety of 52 points with this draw in a defence-dominated encounter on a sunny but windy Spring afternoon. There was a new face on display, striker Lheureux Menga, signed from the seemingly doomed Grays Athletic, for whom he had scored twice against Borough six weeks ago. His link-up play with Marc Charles-Smith showed promise, and he brought the best save of the afternoon from visiting keeper Turner in the second half. It was quite a while before anything noteworthy happened in this match-up between sides that had already fought out a goalless draw at Wheatsheaf Park four days earlier. Miller-Rodney had the first decent effort of the game, a shot that was heading for the bottom corner of Luke Williams’s goal until a Harrow defender deflected it wide. Harrow were forced to reorganise when Andy Lomas limped off, with Joshua Webb going to left-back. On another day, Harrow might have had a penalty when Coker went in from behind on Marc Charles-Smith, but referee Read, who had an excellent game, waved play on. Charles-Smith then laid Lewis Ochoa’s long throw into the path of Menga, but Coker made a fine interception. At the other end, Joshua Webb got his head in the way of Worsfold’s shot, and Michael Peacock made a fine challenge to stop Hippolyte. Williams was called into action for the first time, making a smart save from Bettamer, who had turned Joshua Webb, and the half finished with Kurtis Cumberbatch’s 20-yarder going narrowly wide. Staines had a good spell as the second half opened, with Bettamer stretching to reach a left-wing cross and sending the ball just wide, the same player then bearing down on Williams but putting the ball wide of the post. Cumberbatch then fed Menga, whose sharp turn and shot drew a fine one-handed save from Turner. The oft-seen Joshua Webb-Michael Bryan corner routine then saw Bryan deliver the ball to the far post, where it was taken off the head of a diving Shaun Preddie by a challenge that took both ball and man. With Preddie prone on the ground, Staines broke downfield and Collins shot wide. Francis Babalola had two shots, both blocked, before a bad clearance by Nicholas went straight to Brown who fortunately shot wide. Joshua Webb’s right-foot drive was blocked, Williams tipped over Brewer’s header and from the resulting corner Coker headed over at the near post. Peacock made a stretching tackle to stop Collins bursting clear before the referee called time on a rather dull game. Harrow now have two away games, at Havant & Waterlooville this Tuesday, and at Canvey Island on Saturday. 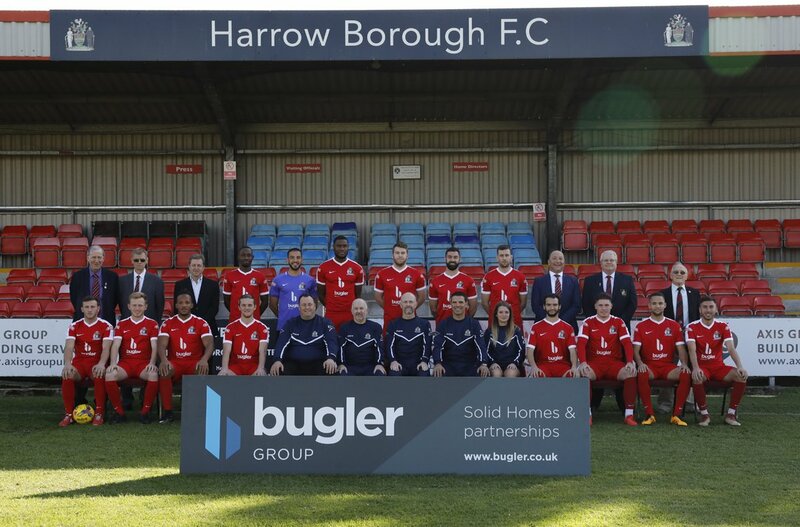 HARROW BOROUGH: Luke Williams, Lewis Ochoa, Andy Lomas (sub George Nicholas, 24 mins; booked, 53 mins), Michael Peacock, Shaun Preddie, Joshua Webb, Francis Babalola, Kurtis Cumberbatch, Marc Charles-Smith (sub Lewis Driver, 75 mins), Michael Bryan (sub Harry Newman, 75 mins), Lheureux Menga. Unused subs: Jemel Laazizi, Will Turl. STAINES TOWN: Jack Turner, Tom Day, Tyrell Miller-Rodney (booked, 68 mins), Wadah Ahmidi, Afolabi Coker (booked, 62 mins), Tommy Brewer, Tom Collins, Bayley Brown, Mohamed Bettamer, Johnson Hippolyte (sub Nebay Haile, 70 mins), Max Worsfold. Unused subs: Lee Wyatt, Makhosini Khanye, Ryan Case, Devante McKain.